Engagements are always an exciting and memorable occasion so why not turn that happy memory into a beautiful keepsake? Today, Maxine is going to show you how to create a twist and pop scrapbook layout that will help you remember all the little details of that special day. 1. Take a piece of A4 card stock, fold in half and cut to make a 15cm square card blank. Layer two complementing First Edition Floral Fusion sheets to the front with Dovecraft Perma Fix Tape. 2. Cut a piece of Dovecraft White card stock down to 25cm x 5cm, score a horizontal line across the 25cm strip, in the centre. 3. Make a mark at the centre of the 25cm fold, measure 2.5cms outwards from both sides of the point. Following from these marks, make a mark at the top and bottom of the strip. Score a diagonal line across to each point to create a cross. 5. Adorn the inside of your card blank with a complementing Floral Fusion paper design ensuring to leave space for a small border. 6. Measure along the middle of the card blank, on the inside, and make a mark in the middle. 7. Take the 25cm x 5 cm piece of card stock, keep it folded as shown. Add Dovecraft Perma Fix Tape to the small triangle section, adhere to the centre of the card as shown. 8. Add tape to the top triangle section, close the card to adhere this section. Make sure that the centre of the folded piece of card lines up with the centre of the card blank. 9. Cut another piece of Dovecraft card stock down to 26cm x 9cm. Score a vertical line at 6.5cm, 13cm and 19.5cm, to make 4 sections. Fold along the score lines, valley fold, mountain fold, valley fold. Choose a Floral Fusion paper design, cut 4 pieces down to 6.5cm x 9cm. Adhere to each section on your card strip. 10. Place this strip of card onto the centre of the card, line the centre of the strip up with the centre of the card. 11. Fold the two side sections up so that you can see the piece underneath. Make a mark where the two middle sections end. Add tape to both sides, in the top section, at the back of your red card strip. Adhere the strip to the bottom strip on the card. 13. Decorate the outside of the card with the Simply Creative Metallic Alphabet stickers to read, ‘Will you marry me?’ along with a few die cut hearts from the Dovecraft Hearts die set. 14. Open the card blank and add the words, ‘I said’ to the top and the word ‘yes’ to the bottom. Decorate with a few more heart die cuts as before and die cut the champagne glass twice on to a coordinating piece of Floral Fusion paper from the Dovecraft Congratulations die set. Overlap the two die cuts with 3D foam pads at the bottom of your card. There you have it! 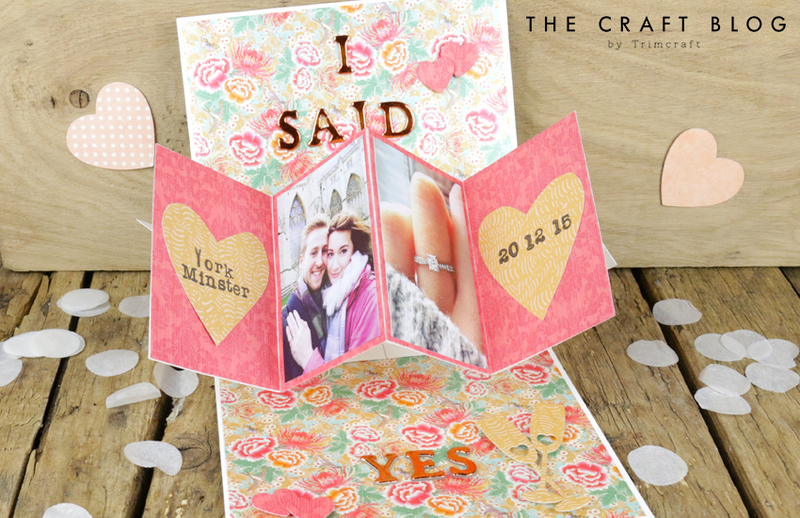 A little pop out keepsake to keep the memorable day alive! How will you use Maxine’s pop out scrapbook idea? We’d love to see so don’t forget to #trimcraft when uploading to social media and to share your makes in the Inspiration area. This is an awesome tutorial, thanks sooo much, I can´t wait to give it a try sometime soon.